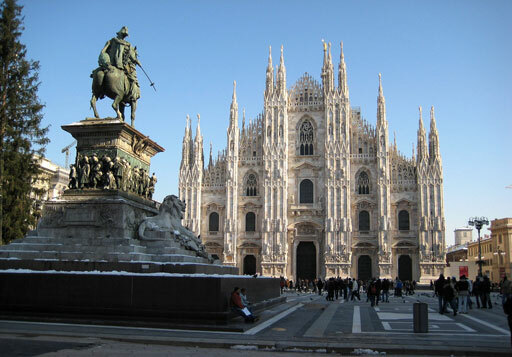 Commissioned by Gian Galeazzo Visconti, the Cathedral started being built in 1386. It is the third largest church in the world after St. Peter’s in Rome and after the Cathedral of Seville. It is overall made of marble, with immense statues, arches, pillars, pinnacles. The statues are about 3500, including the 96 gargoyles. The highest pinnacle is at the height of 108.5 metres, and it has on its top the statue of the Virgin Mary, best known as the “Madonnina”, covered of gold. Inside the church there are many interesting works of art: the tomb of Gian Giacomo Medici di Marignano, known as “Il Medeghino”; the crypt and St. Carlo Borromeo’s statue; the wooden choir-stails; the Tivulziano candelabrum; the Egyptian porphyry basin. There also old stained-glass windows of the XV century. This church was built between 1466 and 1490 by Giuniforte Solari and later partly modified by Bramante who re-designed the apse, the Tribuna, the Cloister and the Old Sacristy. In the Refectory there is one of the most famous paintings of Leonardo da Vinci: the “Last Supper”. The works of the fresco started in 1495 and finished in 1498. Unfortunately it started to deteriorate only 20 years after completion, so it had four restorations: in 1908, 1924, 1953 (after the bombings of Second World War) and in 1977. Inside the church there is also the Crucifixion of Donato Montorfano (1495). 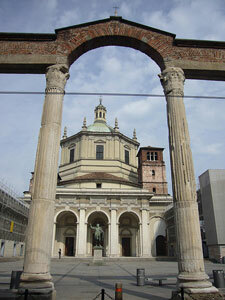 Situated in Corso di Porta Ticinese and fronted by 16 Corinthian Columns from a 3rd century Roman Temple and by a bronze copy of the statue of the Emperor Constantine, the Basilica is a great example of Roman and early-Christian architecture. It was built at the end of the IV century, but it has been a victim of many misfortunes, so it was restored in 1911, 1916 and in 1937/38 . The dome was built later, in 1619, and the façade is of the XIX century. 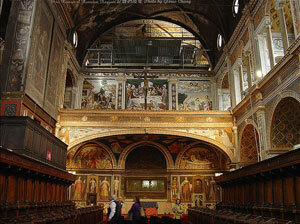 In the chapels of Sant’Aquilino, Sant’Ippolito and San Sisto there are some Christian mosaics and various frescoes. The Church of San Maurizio was built in 1503 as an annexation to the oldest Benedictine convent of Milan, the “Monastero Maggiore”. In the inside there is nave but there aere not aisles. The wooden choir-stalls are still in great conditions; the walls are decorated with paintings of XV century; the foundations and part of the two towers are of the Roman period. The Organ, made in 1554 by Giacomo Antegnati still works and it is used during seasonal organ concerts. The Certosa of Garegnano is a Carthusian monastery founded in1349 by the Archibishop Giovanni Visconti. It was re-built at the end of the XVI and at the beginning of XVII century by Pellegrino Tibaldi, so just a little part of the original structure still remains. Vincenzo Seregni has done the internal works, while Daniele Crespi decorated the walls of the nave with frescoes that represent some episodes from the history of the Carthusian Order and its founder St. Brunone. On the right part there also is a cloister built in the late XVI century. 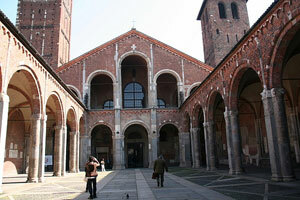 The Basilica of Sant’Ambrogio is a great example of Romanesque architecture. 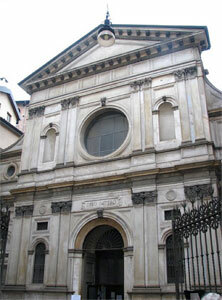 This is one of the oldest churches in Milan and one of most historically medieval buildings in Lombardy. 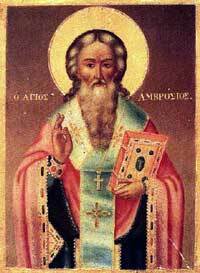 It was begun in 379 and 7 years later it was consecrated by St. Ambrose,who was probably bishop of Milan from 374 to his dead in 397, when he was buried beside the bodies of St. Gervase and St. Protasius inside the Church. In 739 the monastery of the Benedictine Monks was built next to the church and in the 9th century the simple right bell-tower, known as the bell-tower of the monks, was built. It was finished in 1889 with the completion of the three-arched loggia. At the end of the 15th century, Cardinal Ascanio Sforza gave the task of constructing the cloisters and the portico of the rectory to Bramante. In the following centuries other changes were made, but in 1857 the archduke Maximilian of Austria ordered that the baroque additions to the church have to be removed. It was bombed in August 1943 and restored by the architect Ferdinando Reggiori. Inside the Basilica you can find the crypt with the remains of the saint and the gorgeous "Treasure of Sant'Ambrogio", which contains paintings, mosaics, tapestries, marble, clothes and other precious objects. The original carved wooden door with scenes from the Life of David and Saul date from the 4th and 7th centuries; the fragments are kept in the museum of Sant’Ambrogio. The apse is decorated with a mosaic representing a blessing Christ; the ciborium has great Roman columns and a golden altar made by Volvino. 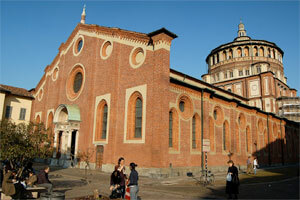 In Via Torino, not so far from Piazza Duomo, there is the church of Santa Maria at San Satiro, that was firstly built in 879 and modified during the centuries, until its last rebuilding in 1476. The façade was begun by Amadeo and Bramante but was modified in the XIX century; the floor by Cristoforo Lombardo was designed in the first part of the XVI century; the bell tower, instead, belongs to X-XII century’s architecture. 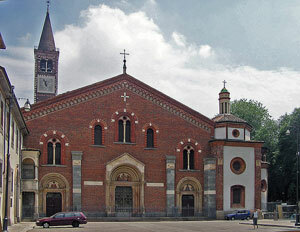 At the end of Corso di Porta Ticinese there is, in Sant’Eustorgio square, the homonymous church, the Basilica of Sant’Eustorgio, probably founded in the IV century by Bishop Eustorgio. The church was re-built in the XII century in Romanesque style. In the right transept there is the Chapel of the Magi with their relics that were stolen by Barbarossa in 1164 and partly returned in 1903. Next to te Basilica you can find the parish museum, developed through the monumental spaces of the former Dominican convent, with paintings of the XVIº and XVIIº century, a monumental sacristy with original furnishing and collection of valuable relics, chapels Solarian and the wonderful Renaissance Portinari Chapel, with frescoes by Vincenzo Foppa. From there you can access also to the only nearly Christian necropolis open to visitors in Milan, with a collection of interesting inscriptions.